Auburndale - Edwin Henry Nearing Jr. went to be with Jesus on Sunday, February 10, 2019. He was a giant of a man, with an always-positive attitude. No matter when you asked him how he was, he would always say, “GREAT”! There were two words we were never allowed to say; one was “can’t” , he said, “there is no such word as “can’t”! And the other was “goodbye”. It was always, “we’ll see you later”! He was born in Waterbury, Connecticut on June 21, 1922. He didn’t have it easy, since his mother died when he was two and he was moved from relative to friends who all helped raise him. He was a very hard worker. At age 12, he had a paper route delivering papers sometimes on bike, but mostly walking 15 miles every day. He worked in the sawmill, where he built up his strength to be able to defeat everyone in arm wrestling; even at age 90, the Canadian champion arm wrestler. He was a farmer for many years; he milked his cows by hand and pasteurized the milk, himself. He farmed until, in 1955, he founded and became President of Dover Mfg. in Waterbury, CT, which later became Sun Corp. in Morris, CT. He led his company in the manufacturing of screw machine parts for aircrafts,until he retired, and moved to Florida, in l992. He always loved sports, and as an adult,played on several amateur teams. He played basketball and baseball, winning several championships. One of his greatest thrills, as a die-hard Red Sox fan, was playing in l988, and l989, at the ages of 67 and 68, in the Red Sox Fantasy Camp, with Ted Williams, the greatest hitter that ever lived. He won the MVP award, received a trophy, and was written up in many newspapers, including The Boston Herald. He was a member of Lake Gibson Nazarene Church, where he drove himself, and ushered up until three months before he died. He loved the Lord, and prayed for his family, and everyone he knew, each night. He had a wonderful singing voice, and at his church in CT, he often sang solos. He loved the songs of George Beverly Shea. In his bed, at the Hospice House, He sang, “How Great Thou Art”, with great gusto, the night before he entered heaven. He will be dearly missed, as he lived his life with such zest. His favorite Bible verse was, “I can do all things, through Christ, who strengthens me”. AND HE DID ! ……. Edwin was preceded, in death, by his parents, Edwin Henry Nearing Sr. and Amelia Boutellier, his first wife, Phyllis Elliott, his second wife, Jane Nearing, a son, Arthur Nearing, and a great grandson, Adrian. He is survived by eight children, Joyce Bushey, Edwin Henry Nearing III, (Linda), Scott Noren, (Tonya), Teri Scott, (Robert), Kathy Nearing, Jon Noren, Paul Nearing, and Marti Thorsen, (George). Thirteen grandchildren, Corby-lane Bushey, Robert Bushey Jr. (Ruth), Kitty Sawyer, Kim Barnard (Jay), Danny Walker (Shanyn), Andrea Tamaro, Nathan D’Angona, Natalie D’Angona, Kristen Nearing, Christopher Hart, Timothy Walker (Audra), David Nearing, Taylor Hart. And thirteen Great grandchildren, David, Rachel, Lexie, Jordan, Aaron, Mariah, Connor, Elijah, Nevaeh, Tricia, Deborah, James and Lanea. 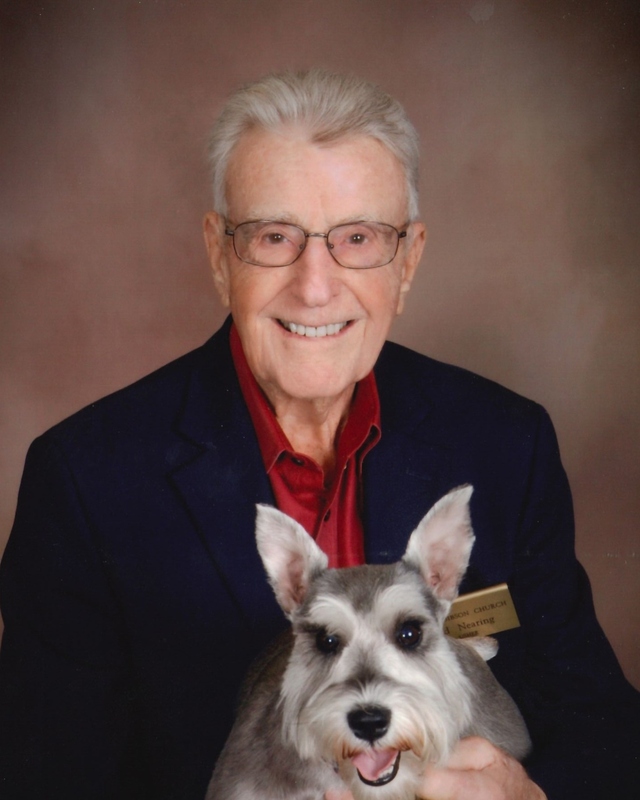 And his precious love, Lizzy, his Schnauzer, who stayed by his side, as he was ushered into heaven. There will be no service in Lakeland. A graveside service will be held in CT, at a later date. However, there will be a visitation on Friday, Feb. 22, 2018, from 5:00-8:00 PM, at Lakeland Funeral Home and Memorial Gardens, 2125 So. Bartow Hwy Lakeland. Memorial Donations can be made to Good Shepherd Hospice, 450 Arneson Ave. Auburndale, FL 33823.